Dental therapist, Gina Buchal talks with Joseph Lawrence of Minneapolis, as she examines his daughter Naomi, 5, at Children’s Dental Services in Minneapolis. Some families travel for hours to get to Children’s Dental Services in Minneapolis, seeking relief from a mouthful of cavities or a painful tooth. Often, these children wind up in Gina Buchal’s chair. But Buchal is not a dentist; she’s a dental therapist, an emerging field of health care providers created by a 2009 Minnesota law. Buchal can perform many of the procedures typically done by dentists, such as tooth restoration and some extractions. Proponents say such mid-level providers play a critical role by treating low-income patients unable to find a dentist who will accept their public insurance. Minnesota’s experiment has been embraced by some other states, including Maine and Vermont, which more recently passed similar laws. Now the debate over dental therapy is playing out in Massachusetts, where — as in other states — the proposal has sparked controversy among dentists, who worry that lower-paid workers with fewer qualifications will be given too much responsibility to care for patients. Many dentists also are concerned about their futures: If clinics can save money by employing dental therapists to provide most care, where will that leave dentists? Proponents argue that dental therapists will bring treatment to more of the poor, the disabled, the elderly, and others who now go without care — or end up in the hospital when their problems escalate. The Massachusetts Health Policy Commission counted more than 36,000 preventable emergency room visits for oral health problems in 2014, costing the health care system as much as $36 million. Several Democratic lawmakers, Republican Governor Charlie Baker, and health care and employer groups support legislation to allow for dental therapy in Massachusetts. They note that even in a state dense with health and dental providers, more than 40 percent of children on Medicaid do not go to the dentist each year. Most dentists in Massachusetts and other states don’t regularly treat poor patients on Medicaid because payments from the government program cover only a portion of the costs. But the payments are enough to cover the salary of lower-paid dental therapists, advocates say. They point to Minnesota as an example of how dental therapy can bring care to more patients in need. At Minneapolis-based Children’s Dental Services, the patient load has increased 22 percent since the clinic began hiring dental therapists in 2011. That’s about 10,000 more patients, most of them children. Incoming dental therapists at the clinic are paid about $45 an hour, while the starting pay for a dentist is about $75 an hour. 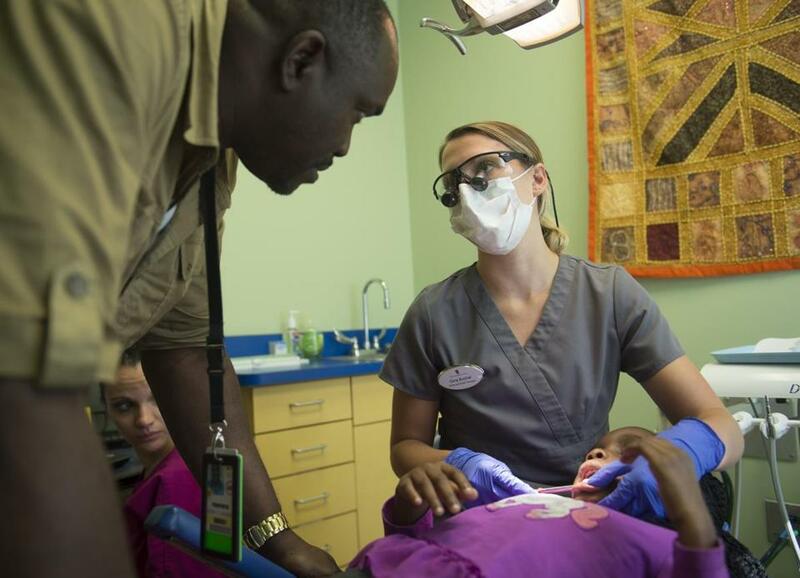 Because dental therapists are paid less, but see as many patients as dentists do, the organization saves about $1,200 a week by employing them, said Sarah Wovcha, executive director of the organization, which primarily serves low-income families. “Around 80 to 85 percent of the needs of our patients can be met by a dental therapist,” she added. A 2014 report from the Minnesota Department of Health and Board of Dentistry found that clinics that hired dental therapists were able to see more patients, particularly from underserved populations. Some clinics reduced travel and wait times for patients. Dental therapists also offered “potential for reducing unnecessary ER visits,” the report said. “It’s been really encouraging and really exciting to see the metrics of real-world dental therapy coming to fruition in Minnesota,” said Jeremy Crandall, of the Pew Charitable Trusts in Washington. Pew lobbies for dental therapy legislation in states including Massachusetts. Dozens of countries and six US states allow for dental therapy in some form, although Minnesota is the most advanced, Crandall said. About 77 dental therapists are now at work in Minnesota, according to Pew. They are required to get master’s degrees. Dental therapists are trained in dozens of procedures, as compared to hundreds for dentists. They must be supervised by dentists and cannot establish their own clinics. In Minnesota, they must predominantly serve low-income patients. But many dentists in Minnesota remain skeptical about dental therapy. Carmelo Cinqueonce, executive director of the Minnesota Dental Association, said there isn’t enough evidence to conclude dental therapy is helping patients gain access to care. He noted that dental therapists are concentrated in cities instead of rural areas, which have the most need. But dentists like Dr. John Powers, who runs a clinic in rural Montevideo, Minn., said the change has helped his practice. Powers said his revenues and profits have increased since he started hiring dental therapists several years ago. He expanded his office from five chairs to nine, and his practice is still growing. His office now sees more low-income patients, and he is freed up to perform more complex — and lucrative — procedures. In Massachusetts, a proposal allowing for dental therapists passed the state Senate last year but was not supported by the House. Sponsors of the bill, modeled partly on Minnesota’s law, have reintroduced it. This time, they’re working with the Massachusetts Dental Society, which has proposed its own version of the legislation. The Dental Society, which represents about 5,000 dentists, supports creating a new kind of mid-level practitioner to work under the direct supervision of a dentist. That’s a stricter standard than advocates of Minnesota-style dental therapy would like. The Dental Society wants these mid-level practitioners to work in geographic areas known to have a dental care shortage, and to focus almost entirely on Medicaid patients. The society also argues that only dentists should be allowed to pull teeth. Advocates for the Minnesota model, however, want dental therapists to be allowed to work under the “general supervision” of a dentist. This would let them to treat patients in settings other than dental clinics, such as schools and nursing homes, advocates say. Dr. David P. Lustbader, president of the Massachusetts Dental Society, said, “It’s kind of simplistic to think you’re going to be able to do much dentistry in a nursing home or a school. More fundamentally, the Dental Society disputes the fact that people don’t go to the dentist because they don’t have access to one. Lustbader said there’s no shortage of dentists in Massachusetts, and that Minnesota’s experiment with dental therapy has not been as rosy as advocates imply. At least initially, he said, Minnesota dentists reported the therapists were not sufficiently trained. But state Representative William “Smitty” Pignatelli, a Lenox Democrat and one of the sponsors of dental therapy legislation in Massachusetts, said he visited Minnesota last year and found that dental therapists were helping patients in need.